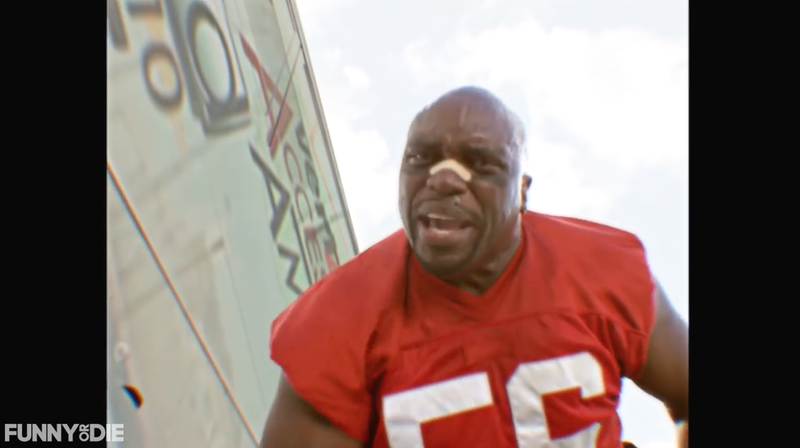 Terry Tate, the fictional office linebacker from Reebok's famous ads a decade ago about proper behavior, is back to weigh in on the 2016 election. And the result is spectacular. A new clip from Funny or Die features the character, who famously and forcefully disciplined white-collar drones slacking off on the job, doing what he does best—this time, to Republican presidential nominee Donald Trump. As Trump and Bush stand creeping on actress Arianne Zucker, Tate suddenly flies into the shot to deliver his characteristic body slam, to a seamlessly edited-in Trump lookalike who crumples like a rag doll. It's a deft bit of film craft, using body doubles and camera magic to realize a scene of which many voters, living in a civilized society, probably thought they could only dream. The fantasy doesn't end there. As the Trump stuntman writhes on the floor, Tate delivers a verbal dressing down, rebutting the candidate's attempts to dismiss his own bragging about sexual assault as harmless locker room talk. In the video's final moment, Tate even gets to mock Trump's catchphrase from The Apprentice, telling Bush, unceremoniously, "You're fired." While the violence is sure to rub some (humorless) viewers the wrong way, it's a brilliant bit of fictional commentary about a public figure who has been accused of grabbing or kissing nearly a dozen women without their consent—and who seems generally intent on making a mockery of reason, dignity and the American democratic process. If only Tate could have moderated the debates, too.